When you buy plants online from Wilson Bros Gardens you can expect to receive large size, nursery and garden center quality specimens growing in their pots that are ready upon arrival to plant and thrive for years to come in your landscape - Guaranteed! There are many very good reasons we think you should know as to why Wilson Bros Gardens specializes in growing and shipping only larger size ornamental plants and trees in larger size nursery pots. Most important to us is that we want our customers to have the highest degree of success with their landscape plantings. We do that in many ways, including providing LOADS of expert planting and care advice on every plant page in the website and in our blog articles, but it really starts with providing our customers with a larger "landscape ready" plant. While many online nurseries have gone to offering tiny little plants in tiny little pint-size pots that we professional growers call "plant liners," Wilson Bros Gardens offers much larger plants that have developed a much larger root system in a much larger pot. For example, when growing our plants, we transplant a small pint size liner plant to a 1 to 3 gallon size nursery pot and then grow it for 6 to 18 months or more in a controlled environment until its roots have completely filled the soil in the pot. The end result is a plant that stands a much greater chance of long term survival after you've planted it in your outdoor landscape, not too mention a plant that requires much less attention and care on your part to thrive. When a pint-size liner plant is planted directly in the outdoor landscape, which is an uncontrolled environment, the odds of long term survival greatly decrease. A few days of heavy rain resulting in soggy soil and the little plants will most likely develop root rot or other deadly plant diseases. One hot and dry day without water and the plants will dry up and likely die. Needless to say, when this happens you will have wasted your money, not too mention the time and effort you expended in planting and care. Essentially, these little liner plants aren't ready for life in the great outdoors, and this is why we don't see professional landscape contractors planting them in their customers landscapes. 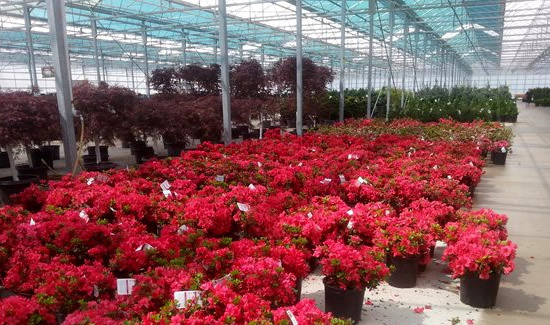 To grow liner plants to a larger size they belong in a controlled environment, such as a greenhouse or a growing nursery, where soil moisture, light and other conditions can be closely monitored and adjusted when necessary by professional growers. Being a professional nurseryman myself, even if I were to plant small liner plants outdoors in my own landscape the survival rate might be 50 percent, and that's only with some luck. The success rate would depend on weather conditions and how much time I had to closely monitor the little plants over the 6 to 12 month period of time they were trying to establish themselves in the ground. On the other hand, in the controlled environment at our nursery we have a 99.5 percent survival rate growing the larger, landscape-ready plants we offer for sale on WilsonBrosGardens.com. Bottom line, as with other products you buy, you get what you pay for when it comes to plants. Thing is, many online nurseries are selling their little liner plants for as much if not more than the price we offer for our much larger plants. A word of caution: Beware of online nurseries that don't publish the size of the pot as it will most likely be a liner, plug or small bare root plant. 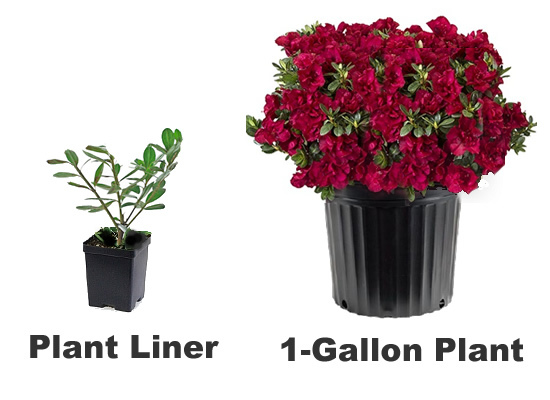 I almost forgot!...there's one more reason we don't sell and ship small liner plants to our customers. Every year, we sell and ship hundreds of thousands of plants to thousands of customers all over the U.S., and that number continues to climb rapidly. As things are now, we get very few complaints about plants purchased from us that have died after our customers have planted them in their landscape. We know that if we started selling little liner plants the number of customer complaints would skyrocket and we don't want to have to launch and staff a new complaint department! More importantly, we care too much about our customers and their landscaping success. We consider ourselves the grower and our customers the landscapers.